USAA’s customer satisfaction ratings are among the best in the industry. Consumer complaints are around the industry median for auto insurance, with fewer than the median for home and life insurance. Earns 4 stars out of 5 in NerdWallet’s ranking of best car insurance companies. USAA offers a wide variety of insurance products and gets high marks in customer satisfaction surveys. Customers can also invest and bank through USAA, which is the fifth-largest auto insurer, according to the National Association of Insurance Commissioners. 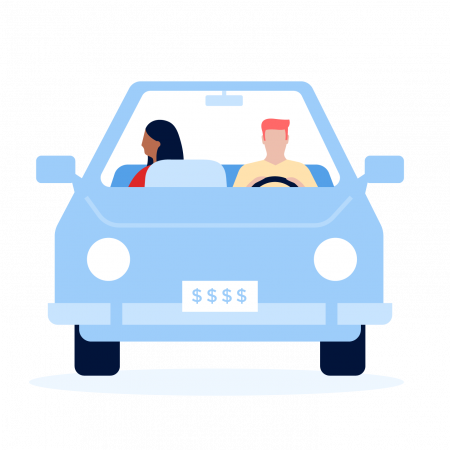 In NerdWallet’s analyses of car insurance rates across the country, USAA frequently offers the lowest rates among the large insurers we compare. USAA offers the usual types of auto insurance coverage and discounts to its customers. Accident forgiveness: With this add-on coverage, USAA won’t increase your auto insurance premiums after one at-fault accident if you are accident-free for five years with the company. Not available in all states. Identity theft coverage with a limit of $5,000 to pay expenses to restore your good name if you’re a victim of identity theft. Military uniform coverage: If your uniform is damaged or stolen in an event your policy covers, and you are on active duty or deployed, USAA will reimburse you without a deductible. Replacement cost coverage: If belongings in your home are damaged or stolen, USAA will reimburse the cost to replace them, rather than the depreciated value, like most home insurance policies. USAA offers a full range of life insurance products to military members and their families, including permanent life and term life insurance. Accelerated review: If you’re being deployed soon, USAA may be able to accelerate your application review so you can get coverage before you leave. Severe injury benefit: USAA will pay $25,000 to active service members with this policy who are severely injured in the line of duty. Coverage during time of war guarantees you will still be covered if your death is caused by terrorism or during war. Expandable coverage: If you’re between 18 and 35, you can add $100,000 worth of coverage when you marry, buy a house or have a baby. Military policy replacement: If you retire or are discharged from service, you can replace some or all of the military’s life insurance policy (known as SGLI) with USAA coverage. USAA’s financial strength is “superior,” according to ratings agency A.M. Best. Financial strength is important because it indicates how well an insurer can pay claims. USAA had close to the median number of complaints for auto insurance to state regulators in 2018 relative to its size, according to the National Association of Insurance Commissioners. It had fewer than the median number of complaints about home and life insurance. The USAA website is packed with information about coverage options and advice on topics such as how to live in retirement, plan your estate or buy or sell a home or car. Planners and calculators help you determine your insurance needs. The USAA mobile app provides secure account access. You can pay bills, download ID cards or file a claim.